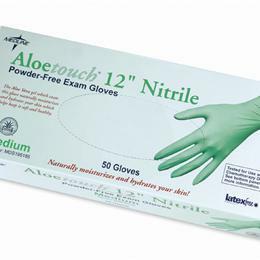 Aloetouch 12" Nitrile Exam Gloves: These Aloetouch Powder-Free Nitrile Gloves Offer Durable Protection Combined With The Moisturizing Benefits Of Aloe. The 12-In. Extended Cuff Provides Extra Protection Between The Cuff And Sleeve. Textured For A Secure Grip. Powder-Free And Latex-Free. Enjoy The High Level Of Barrier Protection Of Nitrile With Comfort And Tactile Sensitivity Similar To Latex. Tested And Approved For Use With Chemotherapy Drugs, Formaldehyde, Gluteraldehyde And Chlorhexidine Gluconate. For Further Information, Please Call The Accucare Division At 847-837-2713. U.S. Patent Nos. 6,274,154 & 6,423,328 Large.